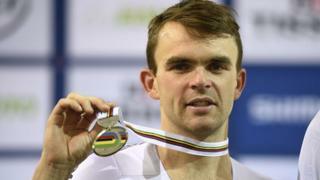 A two-time Olympic medal-winning cyclist, Jack Bobridge, has been accused of dealing drugs in his native Australia. Mr Bobridge, 28, was arrested in Perth on Wednesday on five charges of selling and supplying MDMA, including two of a trafficable quantity, police said. He was granted bail on Thursday and will face court again next month. Mr Bobridge retired from cycling last year because of rheumatoid arthritis after a career filled with accolades. He was arrested after police raided his home and gym in separate suburbs of Perth. It followed a long-running investigation into the alleged dealing of illicit drugs in licensed venues around the city. Police said they had charged 61 people and seized about A$1m (£600,000; $800,000) in drugs as part of their operation since June. The drugs included MDMA, crystal methamphetamine, cocaine and cannabis. Mr Bobridge competed in three Olympic Games, winning silver medals in the team pursuit in both 2012 and 2016. He also won four Commonwealth Games gold medals, three track world titles, and broke the world record for the 4km individual pursuit in 2011.